WatchNET Access software is a fully integrated solution for Access Control, Intrusion Detection, CCTV, Time & Attendance and Building Management. This powerful software manages multiple tasks using Windows 7 and Win 8 Professional Versions and supports databases such as MSSQL and MS Access. The software's multi database capabilities allow the customer the flexibility to choose either MS Access database or MS SQL database. Multiple users (software operators) with different levels of access can simultaneously access the system. The system starts with only a single user called "Administrator", and "Administrator" can create different users with different access levels enabling them with access to only to data as allowed by their access rights or privileges. 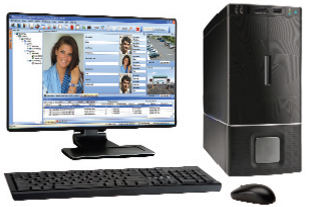 The system set up is made relatively very easy with WatchNET software. Once all the hardware is wired and plugged in to the network, the software scans the network for all installed controllers and lists them using the Search function. Auto or Manual configuration is possible on all the controllers detected online. The operator has the choice to determine whether an Auto download or Manual download to the controllers is needed from the selectable feature of the software. WatchNET Access panels can be connected either through a COM port or through TCP/IP. In case the controllers are interconnected through the RS485 Bus to the COM port of the server then search could be done on the com port as well. However the controller dip switches need to be correctly set before the scan. Interactive Maps provides you with an as built view of the installed system with all the detectors located in the appropriate locations on the map, right on your screen. 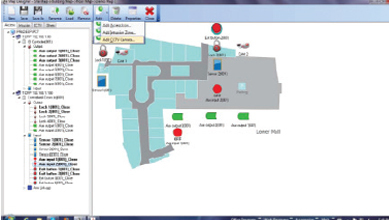 The programmer can design a map using a picture of the facility or a floor plan of the facility as the background. The components of the system that needs to be displayed can be chosen from the list and can be located in the appropriate locations on the map. The pop up function ensures that in the event of an alarm the appropriate map pops up. The alarm can be acknowledged using the acknowledge button on the top and action taken can be recorded. The system also provides real time status display and control of all the devices on the map. The system enables the operator to monitor entry of personnel on site in real time. The person's database picture along with his credentials is displayed. The latest entry is shown as a large picture while the previous three is delegated to smaller screens on the side. 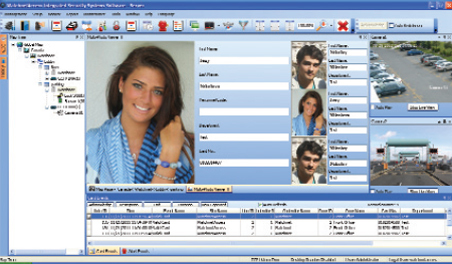 This feature facilitates video verification through camera pictures as well. The system also enables specific events to pop up boxes from different areas of the screen. With this the operator is easily available to identify whether the entry is a regular entry which pops up from the right hand side bottom of the screen or an alert which can pop up from the left hand side top corner of the screen. These features reduce stress on the operator as they don't have to stay focussed on the screen all the time monitoring the events. The colour of events as it appears on the screen can also be configured making it specific to different organizations. 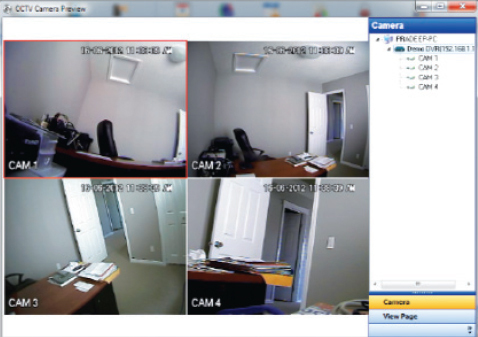 The WatchNET Access software is seamlessly integrated with CCTV system through DVR/NVR and IP Cameras. Currently it is integrated with all WatchNET video products and a few other supported brands. Integration can also be developed as per clients requirements provided the requirements needed for integration is provided to us. Integration is achieved by TCP/IP communication with the required video platforms. As is the case with controllers, the software scans the network and identifies the DVRs. NVRs or IP Cameras. Once identified the cameras in the system can be located on the maps. The live image from the cameras can be seen on the video monitor slots on the screen by clicking on the appropriate cameras. The system also automatically brings up the appropriate cameras if they are tagged to doors upon events. Snapshots or Video clips can be recorded on specific events. These events are saved on the server and can be recalled at any time through the event viewer or reports from the system.